Pankhurst in the Park 2018 artist in residency Ekua Bayunu's video artist is now live - enjoy! Pankhurst in the Park is proud to present this year’s artist in residence Ekua Bayunu’s “Women Hold up Half the Sky”, an interdisciplinary project taking place over eight weeks between April 14th and June 9th. This is an invitation to join us on the final date, when we will take the opportunity to celebrate the project and what it’s participants have produced in Alexandra Park. There will be music, spoken words, exhibitions, a sculpture trail, art workshops, and a closing party at the Pavilion Café. 2018 marks both the centenary of women (over thirty) winning the right to vote in England and the third and final year of the Pankhurst in the Park program. We commemorate this historic achievement and reflect on the ongoing issues with the political agency and representation of women today. One of the ways we have responded to this is by using this project as a platform to showcase the wealth and talent that female artists, in Manchester and internationally, have to offer. Ekua’s proposal led to her being awarded the artist in residence commission by a selection panel of eminent figures within the Manchester art community, among them John McGrath, director of the Manchester International Festival and Helen Wewiora of the Castlefield Gallery. Other commissioned local artists include Anna FC Smith and Tasha Whittle. I was thrilled to hear I had won the residency. It means so much to me to be able to work with Alexandra Arts, with all their passion and creative energy AND it means so much to me to be able to bring the local communities that I cherish, into this creative enterprise. In between the opening and closing dates of “Women Hold up Half the Sky”, Ekua will be coordinating local community engagement and off-sight female artist studio initiatives in the form of a series of meetings and workshops. Ekua’s project is run in association with Global Arts Manchester, a group she co-founded. Alexandra Arts teamed up with NYC-based publication 511 Magazine to produce a special edition for this year’s Pankhurst in the Park, published on March 8th, International Women’s Day. It includes an article on Ekua’s work by NYC-based artist Katie Cercone. It also features art, prints, and articles by a number of other artists who are contributing this year including Anna FC Smith, Tasha Whittle, Go! Push Pops (2014’s artist in residence), Marilyn Minter, Melanie Banajo, NARCISSISTER and much more. Printed copies are available at all our events and as a free download. Find out more at www.alexandra-arts.org.uk. Comments, photos, and interviews are available. Please contact Lotte Karlsen by phone on +44 (0)7816683171 or email press@alexandra-arts.org.uk. I am immersed in planning the final event on the 9th June. ( and making sculpture, running workshops, interviewing women on video....). I'm having a Walk the Park session on Sunday 13th May to help interested people understand the 9th June and how they might contribute, meeting at Coffee Cranks at 11am. Maybe you fancy coming down and finding out more about it then and understanding it in the context of the whole event? Here's some opportunities I’m offering local people, including you and your teams, to get involved in. In the Lodge, I will have a small exhibition in the 'conference room', themed around 'Our Mothers' , I will present a cabinet of items, made, found, owned by our mothers or about our mothers. If you have a small thing you could contribute, I’d love to talk to you about it. Sound Artist , Danielle Porter will be making a sound scape of sounds from the park to play alongside the cabinet. She will be popping in to introduce herself this week and talk about how she would like to capture the sounds of your locations within the park. Interviews. I’ve just completed 10 interviews with a very varied group of women in the Lodge. In the Sky Women’s studio, throughout May, I will continue to interview women about their feelings about voting and other ways we can shape our worlds. Email me for the address if you would like to join us there. We will also be making the sculpture there for Baby Sculpture Play area and the Woodland Walk. Art Workshops are happening in the park, in the Community Room in The Depot at the bottom of Russell Street on Thursday 3rd May, 17th May and 24th May. 11.30 - 2.30pm. I am currently looking for acoustic musicians and spoken word artists to perform. I know many of you are multi talented and if you'd enjoy sharing these skills with others in the park on the 9th June, please let me know and please share this invitation across your networks. ~Womenholduphalfthesky is the name of my residency in Alexandra Arts as part of the Pankhurst in the Park 2018 programme initaited by Alexandra Arts. The residency launched officially on the 14th April with the support of Global Arts Manchester and will conclude with an interactive celebration event in the park on the 9th June.. The theme of the residency has been an exploration of and a celebration of women taking an active role in shaping our communities, from the home, to the local , national and international. I would really like to involve as many people as possible in the park on that day. There will be exhibition spaces, temporary sculpture in the woodland walk, an acoustic music space, a spoken word space, a planted installation , a baby sculpture play area, workshops......maybe even a table tennis tournament!!! The idea is for as many creative people as possible living near or with a relationship with the park to come along and participate. Hope this gives everybody a good insight into some of the things that are happening? Do let me have any questions about the event or any other areas of the residency. April 14th, 2018, marks the launch of the 8-week interdisciplinary project “Women Hold up Half the Sky” led by AIR Ekua. Bayunu will be running community-oriented sessions in the park and an offsite female artist studio initiative. On June 9th, 2018, you are invited to a celebrate the AIR showcase event, hosting happenings all around the park, culminating in a closing party at the Pavilion café. All in association with the Global Arts Manchester. 2018 marks the centenary of women’s right to the vote. 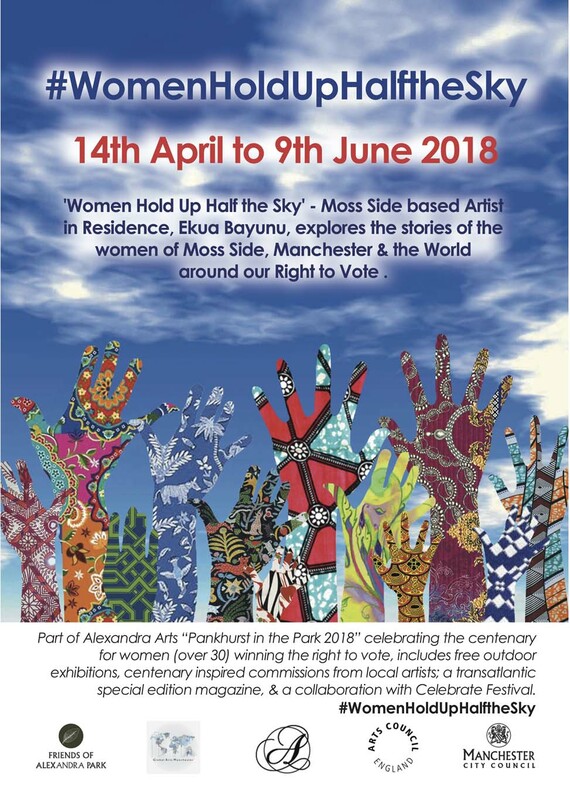 Today, Alexandra Arts’ Pankhurst in the Park, is proud to honour this historically significant moment by announcing that the position of Artist in Residence for Pankhurst in the Park, 2018, has been awarded to local artist Ekua Bayunu, who will be taking up residence at Alexandra Park between the 14th April and the 9th June. 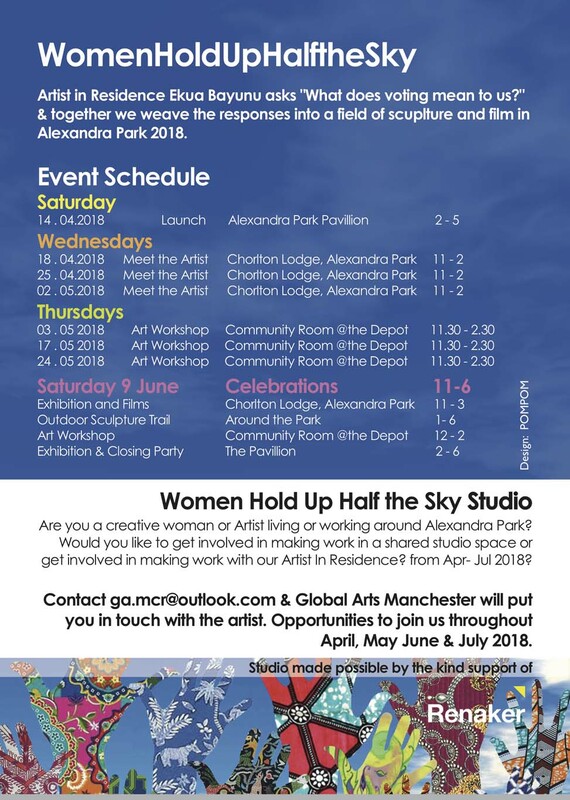 The 8-week project will incorporate elements of sculpture and film, and will include the participation of a diverse range of members of the local community; who can get involved with workshops held at Alexandra Park’s Chorlton Lodge and Depot. Dates will be listed shortly. On June 9th, 2018, to celebrate the close of Ekua Bayunu’s 8-week AIR project, “Women Hold up Half the Sky”, you are invited to participate in a day of events presenting and reflecting on the work. The celebration will host happenings all around the park, all culminating in a closing party at the Pavilion café. The project draws from a central theme of the Pankhurst in the Park project, the legacy of the suffrage movement and the special significance of Alexandra Park in this history. Emmeline Pankhurst lived just on the borders of the park and 2018 marks not only the centenary of the right of women (over 30) to vote. It will also be a hundred and ten years since thousands of suffragettes marched in Alexandra Park. Bayuna’s work will expand beyond local concerns to build on the themes of global women’s leadership and consider culture, the arts and creativity as tools for active citizenship of central significance. Already with significant experience as an artist, Bayunu moved to Manchester in 1993 and has since then produced several high-profile works around the city (“Sensory Garden” in Hulme Park, “Anansi Mosaics” at Royce Primary School), worked in outreach support at Manchester’s Contact Theatre between 2001 and 2006, worked from her studio at Artwork Atelier in Salford, and organised exhibitions celebrating Black History Month in collaboration with Global Arts Manchester in 2017. Ekua started 2018 with her solo exhibition titled “Re:Birth” at Manchester’s Chuck Gallery. She has lived and worked as an artist and tutor with a keen sense of community participation for several decades.